Since time immemorial stories have been known to not only captivate and intrigue but they also create an avenue for emotional connection. Being a nonprofit, your story is the most interesting to tell. Nonprofits need to tell their story in order to make its case and emphasize the important work it’s doing. 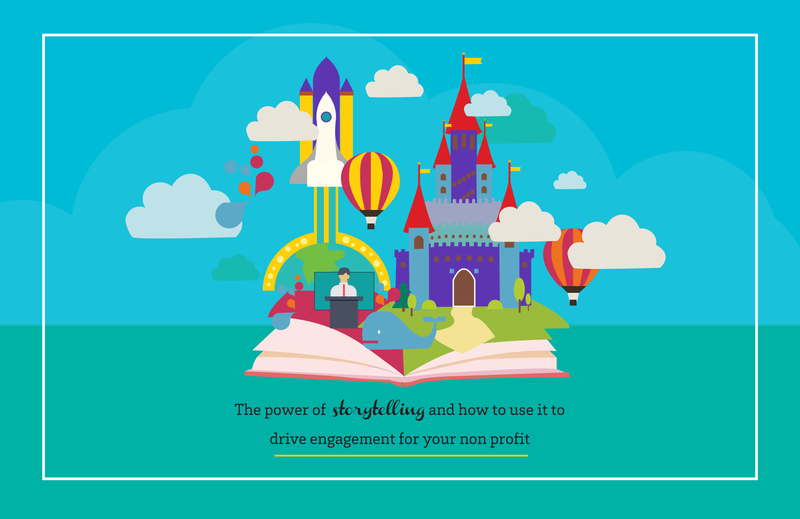 Nonprofits can use stories to differentiate from other organizations doing similar work as well as engage current donors and volunteers and attract new ones. Storytelling is integral to a nonprofit’s ability to advance its mission. According to Waggener Edstrom, 56% of individuals that support nonprofits on the social Web confirm that compelling storytelling is what motivates them to take action on behalf of nonprofits. Storytelling cuts through the mass of information surrounding us. Stories are impactful, compelling and memorable, they engage the hearts, minds, and souls of the readers. This helps nonprofits in driving more engagement, raising more funds, and having a greater social impact. When you do this, your creative partners can then seek out content and storylines that speak to them, and maintain the relevant connection between you and your targets. Create stories relevant to your audiences. Know your audiences and what they care about, then focus on their passions. Remember that whatever story is, you always want the audience to quickly pick up on it, understand your message and connect with you in all the ways you intend. In addition, you should also be clear on what the message itself is. Today, you can use many tools to tell your story. However, throughout all of these, you must ensure that your promise and messaging remains the same. This retains credibility, which is one of the fundamentals people seek before they can entrust their time, goodwill or resources, including funds, to you. Don’t Forget to base your stories on reality. Use figures links to proven research or studies and short definitive phrases where required. These give an understanding of scope or proportion, or can also draw attention to the extent of a spiraling issue. It also lends credibility to your work and provides proof and evidence of any assertions you make. To be effective, include and provide means for audiences to reach you wherever they find you. Factor in also, all the ways in which they would probably engage with you, whether as volunteers or donors for example. List down the kind of engagement you want from them, and then clearly provide all the means and actions to allow it. Ideally, you want people to act as soon as they engage with your story, which has used emotion to drive a sense of urgency that would more likely see them act. Do not lose potential targets by investing in content, but not providing them a way to immediately act on it. In addition to encoding emotional appeal into your story, use a human face now and then to speak directly to your audience. It has a similarly powerful effect on the audience. Add detail to your story. Imagine how you would feel watching a video that uses only a single color scheme, short sentences about what you do here and there. It would feel flat, and you would quickly click on in search of more interesting content. Imagine then if you watched something that has pops of color, tidbits of information here and there, a few photographs and effects. Most people would watch the latter as it captures and maintains interest. Drill down to your nonprofit’s overall and daily activities to seek out points that would translate into such interesting information and content. Consider also, the element of advancement, that is, an existing situation that then looks better because of your intervention. Always scale up, as the story develops. You could start off your story with an intriguing question or character that compels audiences to watch, to see the outcome. Highlight any challenges met along the way, and how these have been met, always including a powerful account of how existing audiences have helped to overcome it. Hashtags are effective codifiers of parts or all of your messaging. They give all the different content you develop a common name that can easily be searched and discovered. They play a part in inducting new people, who contribute to a wider audience. Just as in choosing the right channels for the right message, remember that different platforms are uniquely built and showcase content in a different way. Think carefully, therefore, about where each kind of content should appropriately go. Videos showcase motion and sound, for greater, more compelling impact. Always make it a part of your messaging plan. Understand what would drive them to engage with you and then contribute. Ensure then, that you always incorporate this through creative, resonant storytelling. Include your Audience in the Story. Show, as much as possible, and in creative ways, how the audience’s donation drives the mission forward. This inclusion underscores their role. It also reframes the reason with which they engage with you. They will not feel like they are contributing to just another cause, but joining hands with others to drive real change. Storytelling is key to a nonprofit’s efforts to advance its mission. Stories can shape people; they can inspire them to think and act differently. 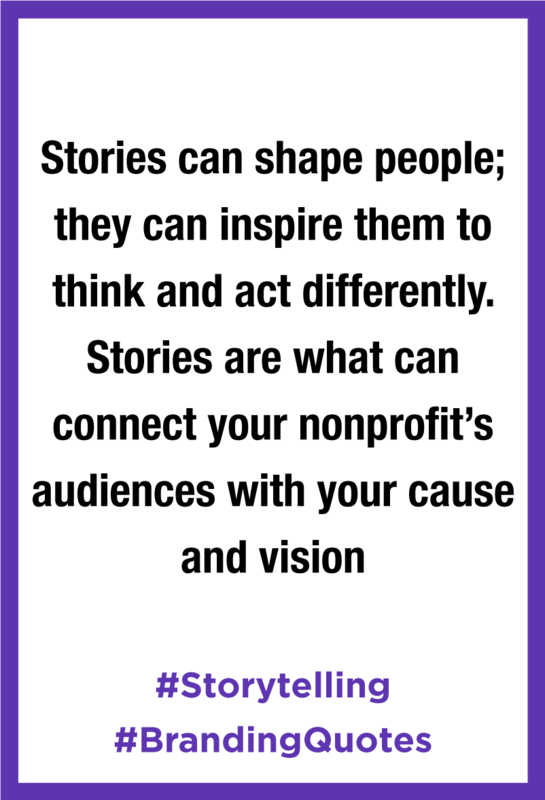 Stories are what can connect your nonprofit’s audiences with your cause and vision. Storytelling cuts through the mass of information surrounding us.